Although I’ve not seen Big Country obsessively (I’m probably just into double figures) I have managed to see them in quite a few guises over the years. 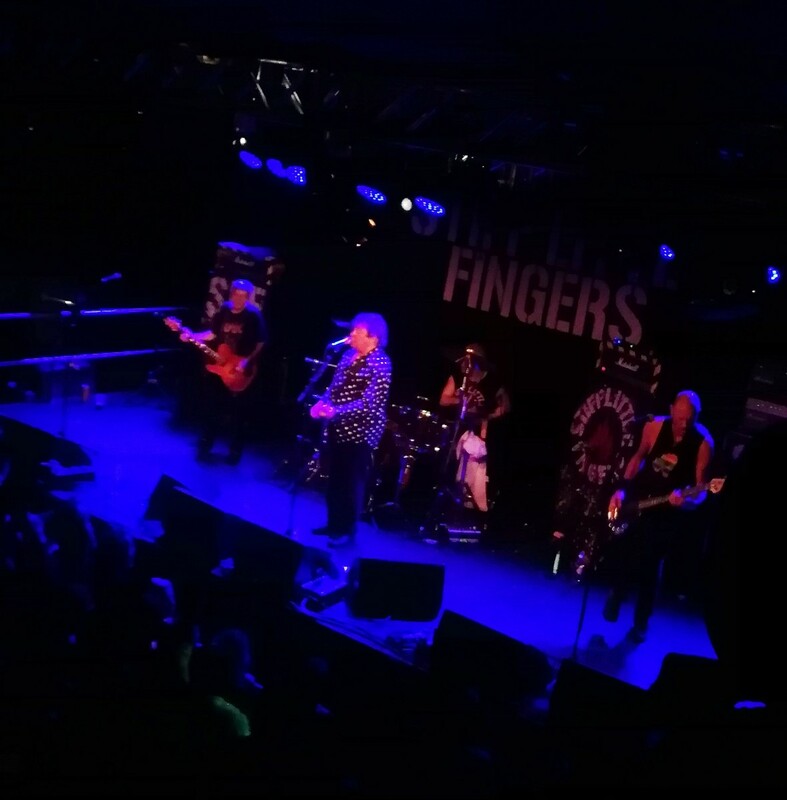 3 or 4 times with Stuart Adamson (the last being the Final Fling tour at Leeds in 2000), once as a 3 piece with Tony Butler singing (Leeds Rios), a couple of times with Mike Peters and now with Simon Hough. Obviously, no lineup is going to meet the power of Stuart Adamson but I’ve enjoyed them all. Shortly before 9pm in a reasonably busy Louth Town hall the band appear and launch straight into 1000 Stars from the Crossing album. I’m surprised just how similar Simon’s vocals are to Stuart Adamson. What follows is a lovable romp through the band’s greatest hits and a generous serving of The Crossing. It can’t fail with those ingredients. It all seems to be over far too quickly and before I know it we’re exiting via the foyer into the cold night air. So this was very inviting. Walked into the Methodist Church to be greeted by Hugh tucking into fish and chips. Had a natter with him for a few minutes whilst a few other punters walked in. He eventually sits at the front of the church and invites us all to sit in the first 3 pews at the front (which we did). We’re then treated to him reading a section out from his book and the floor is open for a Q&A session. Which starts out with some interesting questions from the crowd – apart from one chap who seemed a little “refreshed” and keeps telling us all about his red Indian blood. Eventually, the questions predictably switch to music. Some points below (some of them already covered off on the forums in earlier posts)…..
– Big tour of America being planned for June/July – “What you doing Hugh? East or West coast?” “All of it”. – No contact with Stranglers although he didn’t mention any negativity and wishes them well. – He doesn’t run any more and hasn’t done for over 25 years – points out the dangers of running. Quite an enjoyable evening all round. Great gig last night – I have a serious headache this morning. Got into Huddersfield at about 3.30pm – Nipped into the first pub we found for a quick pint (big mistake). Next thing we know the landlady is bodyslamming a punter into the wall – I check the time – its 3.50pm – wonder what the entertainment in here is like at chucking out time!! Finishing our pints and dodging flying bodies we make our way towards the venue in time for the soundcheck. Had a brief chat with a nice chap from Derby (never did get your name!) and his son who were both happy to be able to meet Hugh. Hugh appears, coffee and biscuits in hand (where’s ours?!) and eventually we get down to picking out the encores – We’re given a choice between 5 Stranglers and 5 solo songs – we can choose 2 of each. I let father and son choose the Stranglers tracks (they choose ATS and Peaches) Lammy chooses Cadiz and I go for “Street called Carrol”. 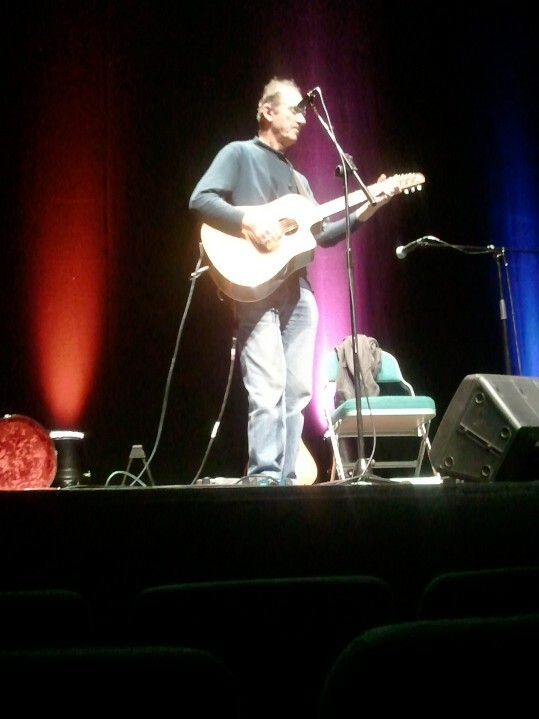 Hugh ushers us to the front of the stage and then begins to run through the soundcheck. We’re treated so several numbers whilst Hugh and tech crew get the sound right. The in house sound crew (I think Ruth and Keith) seem a spot on bunch and patiently work through Hugh’s requests. We also offer feedback on his sound – In the end we get a bit of delay and a “chunky” rich feel – I think it was spot on to be honest. There’s just time to get watered and fed before the main event – We opt for a pizza place just round the corner. Whilst there I get a text from Johnny who’s finally arrived safely and is sat in the pub over the road. We meet him in there for a swift pint then it’s on to the gig. The sound was fantastic and the performance Hugh put in was just amazing. He seemed very happy and played a blinder. Tramp was my fave of the evening – just stunning. Had a brief chat with him afterwards and he seemed in good spirits. Talk of June for a potential release of the album and then tour in October – I think the dates will be on the official site soon. I have some pics of the soundcheck which I’ll stick up – None of the gig, got a slapped wrist off one of the staff there for using my mobile to take a photo (flash was off!) – Ah well, fair enough. A sold out Liquid Rooms on a Sunday night. SLF still command a following. It’s been a while since I last saw SLF. Going back a few years to an electrifying gig at Glasgow Barrowlands on St Patricks night. At the time the crowd were shouting out for “Gotta Getaway” much to the annoyance of Jake Burns. But this evening without any prompting the band rip into it. It’s a greatest hits setlist with a few “new” ones along the way and some rare live outtings from Now Then (“Is That What You Fought The War For?”). It’s a real onslaught of classic after classic. Of course we get Suspect Device at the end and everyone leaves happy. We all leave the pitch black venue and pour out into the street into bright July sunshine. Here’s to the next one. See you up there!